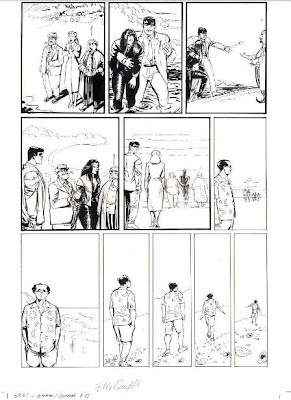 since I'm meeting up with Neil Gaiman in Melbourne this week, here's a glimpse of the Spirit story we put together ten years ago. Someone has posted six and a half of the ten pages online. Steve Oliff did a sweet job on the colours. Next, the above page as it looked when I'd done my part. Since I normally start with the lettering, working this way just felt all wrong to me, and to this day when I look at the printed version all I can think about is that the lettering (can't recall the name of the letterer) was put on after the art (although on page 1 you can see that I was planning it very carefully). The story had a swarthy thug named Squith because Neil wanted to name one of the characters after Mark Asquith for some reason. 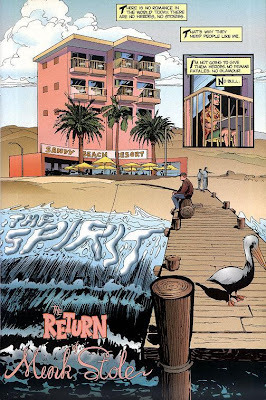 The 'New Adventures of the Spirit' set of stories (including three interrelated by Moore-Gibbons) remains out of print in spite of at least two different publishers intending to do it over the years. I did a second story in the last of the eight issues, by which time I had a better handle on the look of the thing except it was our first attempt at computer colouring in-house here at Campbell Industries and The Spirit camme out looking more like the Green Hornet. The lettering seems a little over the top, especially the large capital letters in the yellow text boxes. It is a little jarring, kind of like really bad overacting (which is different to good overacting i.e. johny depp in the first pirates). p.s. I owe you an update about 'that' book. Soon, I promise. Thanks again! I always felt this was the first genuinely new Spirit story after the initial Eisner run - not limited to homage, but a true translation of what made the series work into the current day. Nice seeing it finally get some attention! "Honestly, I wish they'd post the whole thing.If anyone's going to cry foul for a copyright violation, they'll cry foul for six and a half pages as easily as they will all ten, and all the good jokes in the Tarantino parody have been left out..."
i have the complete scans of the first four issues of the new Spirit comics, or at least up until the Allred issue. 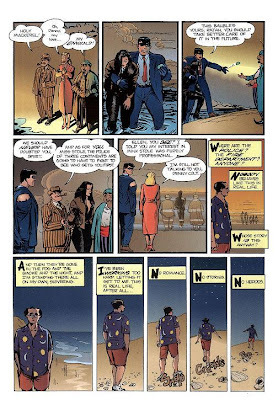 i can post the whole Gaiman-Campbell chunk, if anyone seriously wants that. or eMail? just sayin. This is very late, but I thought you should I know I did post the whole thing. Only not on scans_daily where I get in trouble for such activities.